On top of visual (geometry and shaders) variety, for a shot to look realistic, you also need to add some variety in your character animation. The purpose of Golaem is precisely to help you add this variety as easily as possible, with the least possible input motions. Depending on the available motions or your animation production capacity, as well as the type of shot and camera values, you will need to go more or less in deep in animation variety creation. In this page, we will present the various way to create variety from the easiest one to the most in-details. If we forgot one, do not hesitate to let us know! All Motions related behaviors have Start Percent Min / Max attributes. 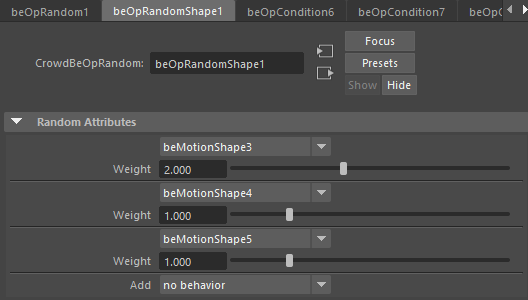 These attributes enable to choose which part of the animation a Motion Behavior will start playing. By default, Start Percent Min/Max are equal to 0, which means the animation will be played from the beginning. However if you set Start Percent Min to 0, and Start Percent Max to 1, each character will pick a random timing in the animation to start playing. It means that instead of all playing the same animation at the same time, your characters will play different parts of your animation at a given time. These attributes enable to randomize the replay speed of your motions. Obviously if applied on walk animations, or if a too big / too small ratio is applied, you could end up with unrealistic animation. However, applying a small ratio range on a stadium audience motion for example can give you a bit of extra variety for a negligible cost. A Motion Behavior can be configured with several motions at once. At runtime (and each time the Motion Behavior is restarted), it will choose an motion in the list and play it. It makes it very easy to load various styles for a given animation. 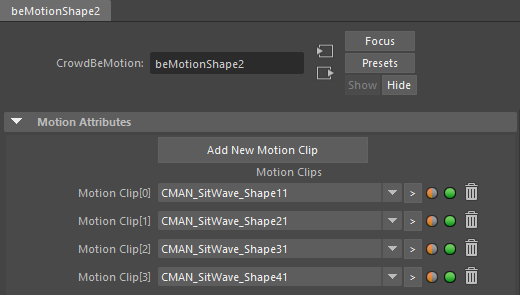 To load several motions at the same time, just double-click on the Motion Behavior in the Behavior Editor, and select the needed files from the file explorer. Note: if some of your motions need different parameters than the others, then it is better to use multiple Motion Behaviors linked together with a Random Operator (see below). 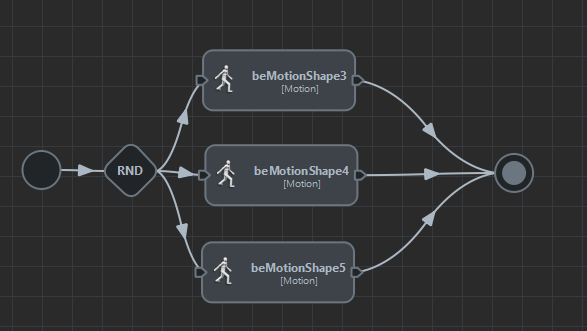 When using animations with close enough styles, or when dealing with Locomotion Behaviors with no more than a neutral motion + another one, it is possible to load several motions for a given speed/orientation. In cases where several motions cannot be loaded in the same Motion Behaviors, to choose different weights between motions, or just to make the randomization more obvious in the Behavior Graph, it is possible to link multiple Motion Behaviors to a Random Operator. To generate a maximum of variety, it is possible to rely on blending in order to play different components/layers of an animation with a different random combination of start percent / speed ratio and animation weights/ratios. Animation can be entirely created procedurally, or an existing animation can be offset by using the SetBone Behavior.